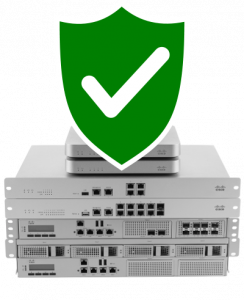 With Cisco Meraki security appliances, we provide you with comprehensive security in a single box! Every Meraki Security Appliance supports several features, like a stateful firewall and integrated Sourcefire intrusion prevention (IPS) engine, to secure your networks. Antivirus and antiphishing threat definitions and filter lists are seamlessly updated, ensuring every MX has bleeding-edge protection from the latest vulnerabilities and troublesome websites. With Cisco Advanced Malware Protection (AMP) for Meraki, a world class malware database is paired with context-aware monitoring and reporting, retrospective malware analysis, and Threat Grid sandboxing to provide an anti-malware solution that does more than just prevent users from downloading malware – it provides comprehensive security before, during, and after a malware attack. Additional services like Cisco Umbrella, provide the first line of defense against threats on the internet wherever users go. It uses the internet’s infrastructure to block malicious destinations before a connection is ever established. By delivering security from the cloud, not only do you save money, but we also provide more effective security. Contact Miadria to start securing your network environment!